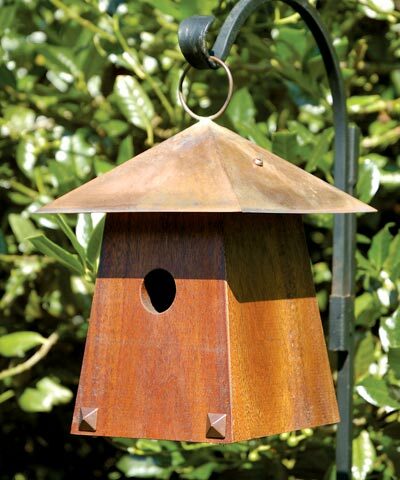 Bring classic architecture into your garden with the Heartwood Avian Bungalow Bird House. Each of the four sides of this home slopes gently outward, lending a sculptural look to the item. Two metal accents at the bottom of the front panel add more lines and angles to the unit, and the large square roof protects the home. A metal loop on the top of the roof adds contrast and allows the house to be hung. The 1.375" diameter entrance hole invites songbirds to enter, and a copper panel on the back of the unit enables seasonal nest checks and cleanings. A hole in the center of the base aids in keeping the nest dry and clean. The dark brown of the mahogany construction contrasts the burnished copper roof, for an eye-catching effect. Add a crafty look to your bird sanctuary with the Avian Bungalow Bird House. Made in the USA.